The Xbox One might not have a virtual reality headset of its own, but now it sort of does, I guess? Continuing its partnership with Oculus, Microsoft announced today that you can start playing Xbox One games on the Rift VR headset—but only on Windows 10. And before you get your hopes up, know that this is pseudo-VR, not a full-fledged VR Halo game or something. 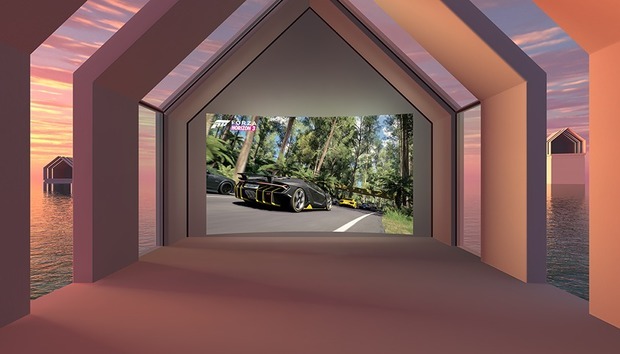 Basically Microsoft is doing the same thing we’ve seen from the VR Netflix, Hulu, and Oculus Video apps—“Here’s a massive TV screen, placed into some benign environment”—except this time it’s tied into the Xbox One’s streaming capabilities. You’ll be able to grab the creatively-named “Xbox One Streaming to Oculus Rift” app on December 12, for free. Having used quite a few of these sorts of apps by now, I can’t say I’m too excited—games are a particularly hard sell on these faux-screens, as text is often illegible and the interface a bit blurry. Movies tend to fare better. Still, it’s a fun little novelty.